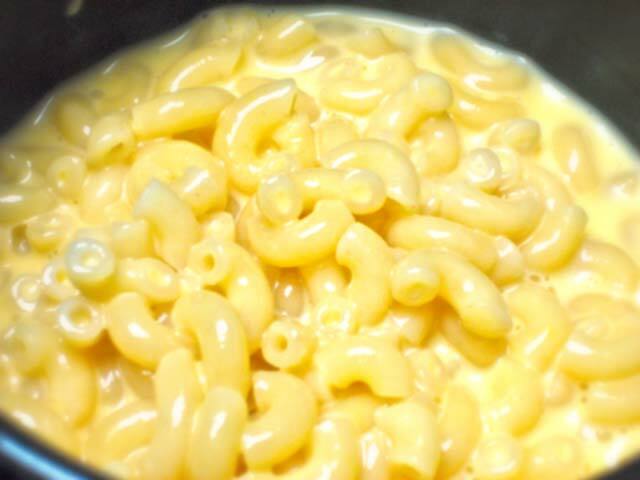 If you lookup comfort food in the dictionary you will probably see a picture of macaroni and cheese. I have never met a kid that does not like macaroni and cheese. It was a favorite dish of mine when I was young, and it is now a favorite dish of my family. Macaroni and cheese recipes are known to come from Italy since medieval times. Ever since, they have been a common recipe in most households. Instant macaroni and cheese dishes never tastes as good as a home-made one. Even the ones that come with a ready made cheese sauce instead of cheese powder are really not that good. After searching for a better alternative, I came up with the following recipe. Add 8 Cups of water and 1 Tablespoon of salt to a medium boiling pot. Once the water reaches a boil, add the elbow macaroni to cook for 7 to 10 minutes according to your desired tenderness. Drain in a heat resistant colander. Rinse the pasta with cold water to stop it from cooking. Keep the pasta in the colander. Melt the butter under low heat in the empty boiling pot. Return the pasta to the pot. Coat pasta with the melted butter. In an mixing bowl, add the eggs, milk, a pinch of salt, and a pinch of pepper. Whisk it throughly. Add it to the pasta mixture. Continue cooking under low heat and gradually add the cheese while stirring. Turn off the heat once you have a creamy sauce. Optional — You can add bits of ham, hotdog sausage, bacon bits to give it a different flavor.